It’s almost two years since “The Decision” brought together a group known variously as the “Superfriends”, “The Heatles”, “The Big Three”, “Miami Thrice”, “DLC and the D-Leaguers”, “The Three Amigos”, “The Three Basketeers”, and, more recently, “Batman and Robin” and “Two and a Half Men”. The disrespect shown in the latter two names is directed mainly at Chris Bosh. The 28-year old from Georgia Tech was the fourth pick in the famous (infamous?) NBA draft, directly ahead of Dwyane Wade and developed a reputation as a tough competitor, forced into playing significant rookie minutes at Centre after the departure of Antonio Davis. His rookie averages of 11.5 points, 7.4 rebounds and 1.4 blocks per game were impressive and he made the all-rookie team along with LeBron, Carmelo, Wade (interesting how he never gets his first name) and Kirk Hinrich. Critics point at Bosh’s inability, at 6-11, to consistently grab double figure rebounds. 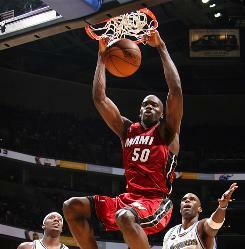 He has, in three different seasons, averaged over 10 rebounds a game, but not since he joined Miami. Given Bosh earns $16M this year, the same as LeBron and a few hundred thousand more than Wade, and is the most important inside player for Miami (we’ll come to that), his unimpressive stats and style of play have led many to dismiss his relevance as a legitimate superstar. Bosh went down with an abdominal strain during the May 13th victory over the Indiana Pacers. The Heat went on to win by nine but the damage was done. Without their third scorer, the Heat were unconvincing in a narrow loss to Indiana on May 15th and got smacked last night, even though they had come back from a slow start to lead at the end of the first. Never has it been more obvious that Bosh is an integral part of this team. Equally, never has it been more obvious that the Miami Heat’s main problem is not how LeBron James or Dwyane Wade perform (even though Wade was atrocious with only five points last night), it’s how unbelievably awful everyone else on their roster is. With Bosh out, Dexter Pittman started alongside Joel Anthony. Although a credible college player at Texas, Pittman was woefully out of his depth against all-star Roy Hibbert. Pittman and Bosh are barely even comparably players; Bosh’s strength is as a jump shooter whereas Pittman does not possess a reliable shot. The other option for the Heat is Joel Anthony (a man who should really be called Jel Anthny), or the doomsday scenario of letting Eddy Curry back into an NBA game. Although the Pacers are an unfashionable side, the balance they possess is becoming clear to many. They have an excellent guard in George Hill, a solid scorer in Granger, Hibbert clogging up the middle and, let’s not forget, they also have David West. On top of that they have some energy off the bench in the form of Tyler Hansbrough and Louis Amundsen. The Heat have Ronny Turiaf and the artist formerly known as Mike Miller, who has been clanking threes this off-season like he has never properly recovered from his hand injury of last season (although he is still shooting about 40% from the three point line). Mario Chalmers really picked up his game last night, filling the gap from game 2 when everyone was asking what the Heat had beyond LeBron and Wade, but the plummeting performance from Wade was to the detriment of the Heat. Wade’s bust up with coach Erik Spoelstra, apparently a result of Spoelstra speaking some home truths in a time out (basically that Wade wasn’t playing well: an astute observation, even if it doesn’t really seem like being a wise move to irritate one of your superstars when you have the shoogliest coat-peg in the NBA), has again raised the spectre of Pat Riley taking control of the team next season. LeBron was impressive again after missing free throws which might have seen the Heat going into game 3 with a 2-0 lead. He has been forced into playing time at the 4 spot which is tiring him out and he has also been on the receiving end of some cheap shots. LeBron missed a technical foul free throw after having his jersey pulled by Danny Granger and Lance Stephenson was seen on the Pacers bench making a choke gesture which would have been infinitely more hilarious if the person making the gesture was even remotely relevant as a basketball player. If the Heat can get their transition game going, there is a chance they could yet salvage this series. There is no definite date on Bosh’s return, so an extended series could see him back in uniform. Even if they do get past Indiana, they will likely match up with the Boston Celtics, whose own big three are playing at a level which belies their advanced years. Then it looks very much like the finalists from the East will meet up with either the San Antonio Spurs or the Oklahoma City Thunder. I dunno about you, but a western winner looks very much on the cards from where I’m sitting. As for the Heat, with a title (not one…) looking increasingly unlikely, questions are raised about what this team might look like next season. Spoelstra may or may not keep his job, but rumours about the future of Bosh (whose reputation has soared in his absence) and even Wade, with Dwight Howard available, persist. There is no doubt that a team with LeBron, Howard and potentially Steve Nash (a signing which would allow Mario Chalmers to spend time at the 2) would challenge for the title next year, but if any lesson has been learned of this season in South Beach, it is surely that depth is an absolute necessity for a championship-calibre team.